*If Meyer lemons are not available, use 1/4 cup regular fresh lemon juice. Trim bottom from sprouts, and remove any loose or bruised leaves. Place shredding disc or fine slicing disc in food processor*, and using feeder tube, gradually shred Brussels sprouts; there will be about 4 1/2 cups. Transfer shredded sprouts to mixing bowl. 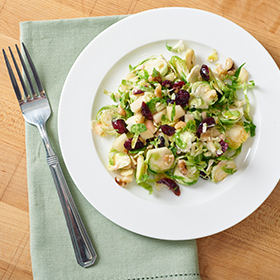 Add apple, cranberries, walnuts, salt, pepper and lemon juice, and stir with a fork for 1 minute to combine well. Add oil and stir well. Cover and refrigerate slaw for 3 hours to overnight. Re-stir before serving. This slaw is best served within 24 hours. *If your food processor does not have a shredding disc, quarter Brussels sprouts vertically and place in food processor fitted with a chopping blade. Pulse until sprouts are finely chopped, stopping several times to scrape down bowl. Take care not to leave big chunks or to turn sprouts into mush. Serving size: 1/8 recipe. Amount per serving: 120 calories, 7g fat (1g saturated fat), 16g carbohydrates, 3g protein, 3g fiber, 130mg sodium.